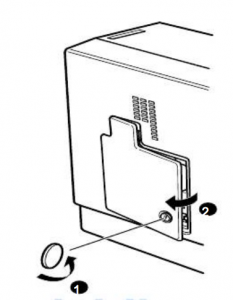 This guide shows how to replace the Epson EMP-7500 projector lamp. The projected image gets darker or starts to deteriorate. The projection lamp indicator flashes orange. Protect your investment and buy a genuine Epson EMP-7500 projector lamp. You will need the Epson ELPLP06 replacement projector lamp. You can find plenty of bargain generic lamps sold over the Internet. But Buyer Beware! These lamps can damage the sensitive and expensive mechanisms in your EMP-7500 projector. They are also more prone to explosions due to the inferior materials and have a shorter life. 1. Turn off the projector power and wait for the cool-down period which is about two minutes. Disconnect the power cord after the two minutes is over. 2. Wait at least 30 minutes to one hour for the Epson EMP-7500 projector to cool internally before opening it up. It should be cool to the touch. NOTE: Do not operate the projectors while the lamp is removed as this may result in malfunctions, fire hazard and other accidents. 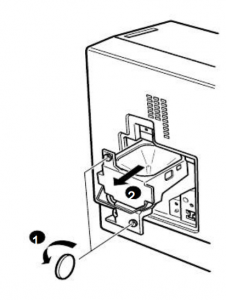 NOTE: The Epson ELPLP06 lamp contains mercury and should not be thrown into regular garbage. Recycle your used lamps! Gently insert the new lamp by lowering it into position. Make sure it is inserted securely. Tighten the screws you loosened. Replace the lamp cover and tighten the cover screw. The lamps timer be automatically be reset to zero. Turn off the Epson EMP-7500 projector and let it stand for at least one hour ever 24 hours. An average use of four to five hours per day will ensure longer lamp life.